Priests are human beings just like the rest of us. Yet the grace of their ordination makes them different, configuring them to Christ in a special way. In their life and ministry, they become windows through which the faithful they serve can see Christ. Catholics across central and southern Indiana have seen Christ in their priests in both the ordinary and extraordinary events of everyday life, in days of joy and in nights of sorrow, in their parishes, schools, hospitals and homes. Many Catholics from all corners of the archdiocese responded to this call. They include a southern Indiana man who lost his home in a tornado, a woman who was the victim of a savage crime, a parish employee who received a warm welcome on a winter morning and a woman whose father had died. 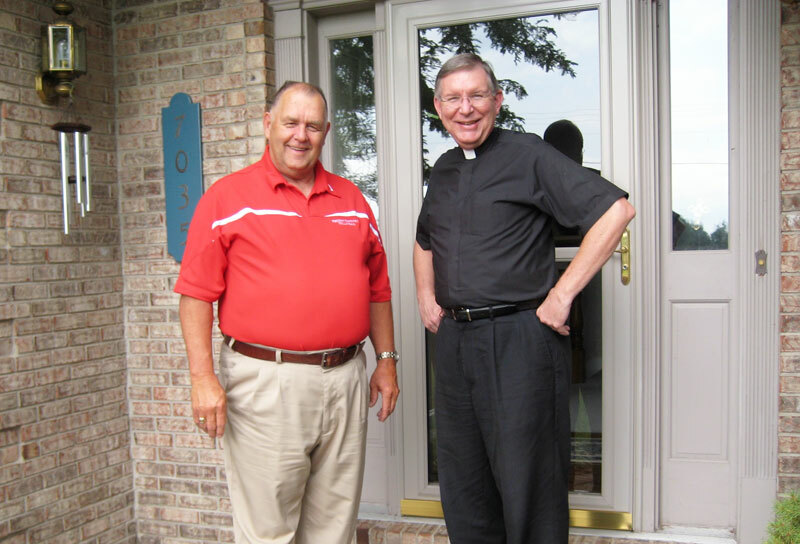 Frank Wiseman, a member of St. Mary-of-the-Knobs Parish in Floyd County in the New Albany Deanery, had known Father Michael Hilderbrand as his children made their way through Our Lady of Providence Jr./Sr. High School in Clarksville in the 1980s and ’90s. At the time, Father Hilderbrand was the school’s chaplain and a guidance counselor there. He now is the pastor of St. Mary Parish in Lanesville. Wiseman gained a new appreciation of Father Hilderbrand when his world was literally turned upside down on June 3, 1990. “I was home alone when a tornado ripped through the countryside and made a direct hit on my home. Within a few seconds, I lost my home, garage, barn and two cars,” Wiseman wrote. “I was asleep at the time with no warning of the approaching storm. The howling of the wind and the multiple lightning strikes awoke me just in time to seek refuge in the corner of my kitchen. I sat there and watched the house crumble around me. “I was saved by the grace of God without a scratch on me. “June 3 was a Sunday. Around noon, as I was looking at the rubble of my home, Father Michael Hilderbrand pulled into the driveway. “Father Mike was assigned to Providence High School in Clarksville. My son had graduated in 1987, my daughter had just completed her junior year there, and Lenor, an exchange student that we were hosting from Madrid, Spain, had just graduated two nights before. “Father Mike had heard that we were hit by the tornado and came as soon as possible to offer his help. He and I prayed together on the front lawn as we scanned the damage. We prayed to God in thanksgiving for keeping me safe, and we prayed to the Holy Spirit to give me strength to carry on and the faith and knowledge to know what to do next to rebuild our lives. “Father Mike asked me if I had contacted my wife, daughter, son and Lenor. I told him that I had talked to my wife and my daughter. They were at a volleyball tournament at Ball State University when the storm hit. Lenor was at a graduation party and my son was staying near Indiana State University for the summer. “I told Father Mike that I had Tim’s phone number and address of where he was staying by the phone, but it was now, like the movie, Gone with the Wind. The only thing I had left was the name of the people he was staying with. “Father Mike said he would be back and would bring home Lenor. An hour later, they returned. Father Mike had called the pastor of the parish in Brazil, the town where Tim was staying in. The pastor knew the man and gave Father Mike his phone number. Father Mike called him and my son was on the way back home. “Father Mike showed me that day that our faith extends way beyond the walls of a church. He showed me that the Catholic faith reaches out into the community in which it serves. Pat and Linda O’Connell, members of St. Margaret Mary Parish in Terre Haute, appreciate Father Rick Ginther, their pastor for the past four years. Like you might expect from other folks who say nice things about their parish priest, they value his homilies and the way he sings at Mass. “Last winter, we had a snowstorm and my husband had to drive my four-wheel-drive vehicle to work. Lo and behold, when he arrived at the church, he discovered he had forgotten his keys for the church,” Linda noted. “He went over to Father Rick’s house and knocked on the door. Father Rick let him use his keys and told him to help himself to a cup of coffee. Pat thanked him and went to work. He was very grateful for the hospitality Father Rick showed him early in the morning. “We also appreciate his ability to sing and his knowledge of music. God has blessed him with a great voice. If priests are sacramental signs of Christ, then they are called to be guides to forgiveness, for Christ himself said on the cross, “Father, forgive them. They know not what they do” (Lk 23:24). 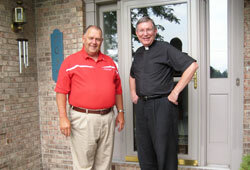 In 1986, Father Stephen Jarrell, currently pastor of St. Paul the Apostle Parish in Greencastle, was the pastor of SS. Peter and Paul Cathedral Parish in Indianapolis. “In November of 1986, I was abducted, repeatedly raped and threatened to be killed. After that ordeal, I couldn’t pray—anger and hatred toward the person who had violated me secretly filled my heart. “For almost two years as the case dragged through the judicial system, I hoped this man now in prison would experience the worse physical attacks and perhaps even be killed. “I didn’t realize then that, regardless of how I felt, God’s love embraced me. He led me to Father Stephen Jarrell. “I still remember every detail of that spiritual encounter. Father listened. He empathized. He did not pass judgment. “Then, to my surprise, he agreed with me when I told him that I couldn’t forgive. Father Steve verified the deep emotional feelings going through me at that time. “Together we took the words of the Our Father: ‘Forgive us our trespasses as we forgive those who trespass against us.’ These were words that I couldn’t say without condemning myself. “He told me to be honest with God and myself. I was encouraged to add my own words to this part of the Our Father. I began by saying: ‘I can’t forgive. God, you will have to forgive for me.’ It took a long time, but gradually God’s forgiveness toward the man became my own. “This meeting with Father Steve was a healing experience, not only in 1986, but also for all the hurts prior to and after that time. “God’s love and protection comes to us through others, especially priests. At 31, Father Eric Augenstein could be the son or even grandson of many of the people he serves as pastor of Our Lady of Perpetual Help Parish in New Albany. “Father Eric Augenstein has only been at my parish, Our Lady of Perpetual Help in New Albany, for two years. “But that has been long enough for me to have my life enriched by this endearing young man who is serving as a pastor for the first time. In the past year, he baptized our 4-year-old grandson, and a son-in-law-to-be, and also witnessed the exchange of wedding vows of this man and our daughter. “Father Eric was such a comfort to me, too, when my beloved father passed away, and he showed up—unbeknownst to me—at my father’s parish to concelebrate the funeral Mass. “His engaging smile and zest for life—and his vocation—are a joy to behold. He is also a wonderful speaker. His homilies offer much food for thought from week-to-week. “He showed his openness to his parishioners shortly after he arrived at Our Lady by offering chat sessions along with his homemade baked goods at the rectory for small groups as a way to meet people. “Recently, I visited Father Eric for some counseling. I had been struggling with an issue and wondered what would Jesus have me do. I rambled on for about 20 minutes and then asked Father Eric for his input. He nailed it with a one-sentence answer.